Everyone I know and can imagine has a part of them that screams for the tasty, unhealthy, trash that our bodies groan after recieving! No matter how health conscious, how self aware and motivated we are, we all give in to our deep fried food craving once in a while. I mean...just look at that! Doesn't that make you want to make a batch right now? 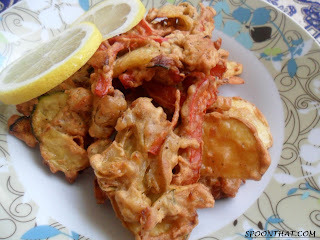 (for those who know what pakoras are) or make you curious as to what they are and how they taste? (for those who have never heard of them). Well, for those of you that have eaten and become lovers of pakoras, i need not say anything. But for those who are new to them, let me just say that they are WELL worth the effort and patience. Each bite takes you to places in yourself you never knew existed! This one is a keeper for sure. 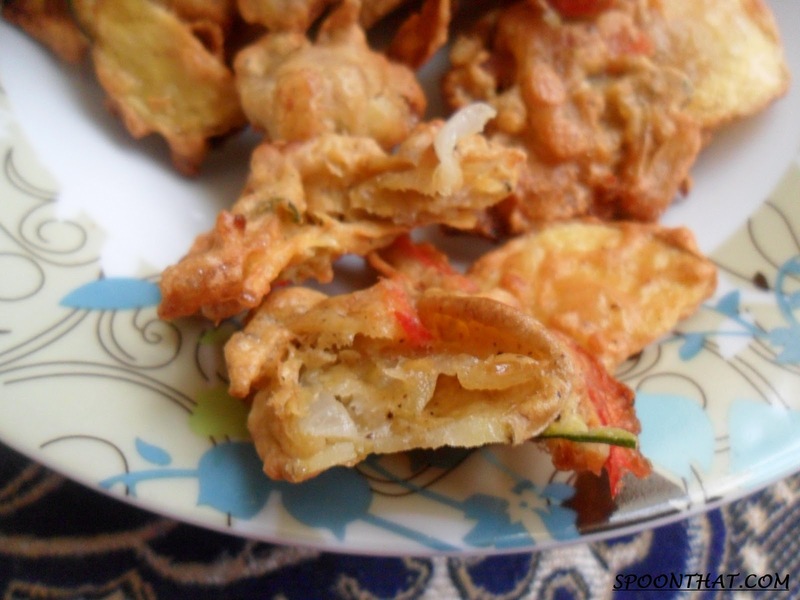 Pakoras are widely associated with rainy days in the south-east Asian continent.Thus all those who haven't experienced what it feels like to have these little treats warm you up from the inside, you really don't know what you are missing! 1) Mix all the ingredients except the flour and oil and leave to marinate for at least 10 minutes. This softens up the vegetables and insures proper cooking. 2) Mix in the flour a little at a time until the consistency of the batter looks something like this. 3) Heat oil for frying and drop spoonfuls of the mixture in the hot oil. It should sizzle right away. 4) Deep fry till golden brown and crispy. Drain and set aside. 5) Serve immediately while piping hot with lemon slices for garnish. 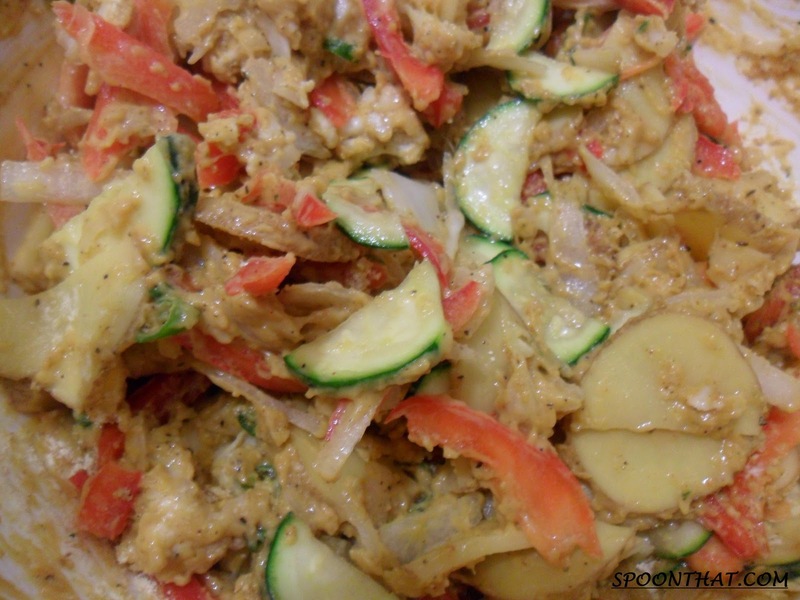 Spoonthat.com is a cooking meals & food recipes blog that features various kinds of food and everything to do with it. Spoon That is a place where you will be able to find recipes from all over the globe that are simple enough to be made in your very own kitchen. Brought to you by a stay-at-home mom who loves cooking delicious meals for her family, SpoonThat.com is guaranteed to provide you with tons of finger-licking delicious recipes for you and your family! Enjoy! SpoonThat.com - Flavorful Food Recipes by The Spoonful! Copyright SpoonThat.com - All Rights Reserved - 2010-2011. Simple theme. Powered by Blogger.